Every year between June and September, monsoon rains inundate India, Nepal and Bhutan. While that presents obvious challenges for humans, it’s just as devastating to wildlife in the region. And the heavy rains can even wash away creatures as big as a rhinoceros. 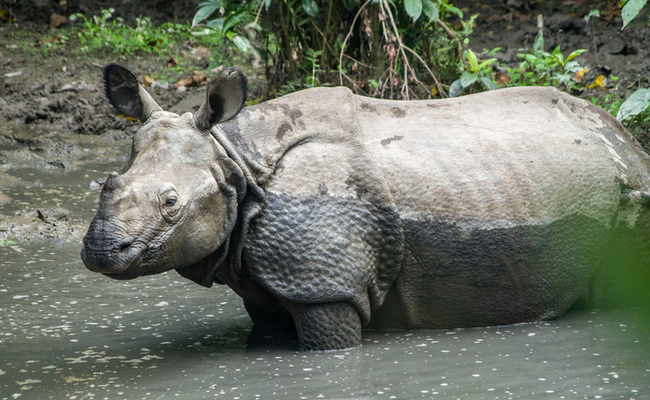 In 2017 monsoon flooding carried away at least 15 greater one-horned rhinoceroses across the border from Nepal to India. 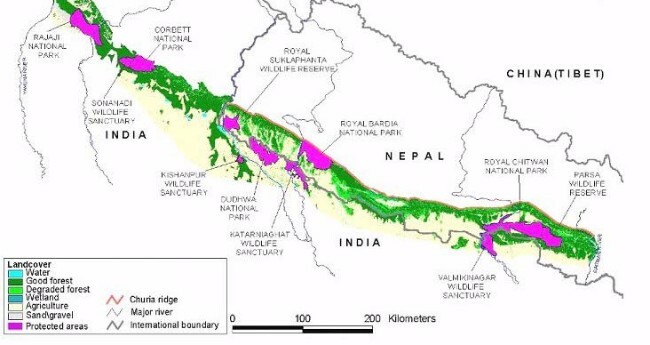 The rhinos, initially located at Chitwan National Park in Nepal, ended up an incredible 62 miles away in India’s Valmiki Tiger Reserve. Now, a team of officials from Nepal and India are working together to save these rhinos from a watery fate. About 50 Nepalese forest and security officers joined forces with 300 Valmiki forest workers to locate and rescue the displaced animals. “Never before had so many rhinos arrived from across the borders in such quick succession and this is the first successful collaboration of the two countries in saving the rare endangered species,” Subramani Chandrasekar, Valmiki Tiger Reserve field director, told Mongabay. The greater one-horned rhino, also known as the Indian rhino, is considered a “vulnerable” species by the International Union for the Conservation of Nature, or IUCN, Red List. Once, many years ago, this mighty species existed across the entire northern part of the Indian subcontinent along the Ganges, Indus and Brahmaputra River basins. The creatures lived in river areas spanning the Indian-Burmese border to Pakistan. Sadly, this is not true anymore. The greater one-horned rhino now lives in riverine grassland areas in northern India and southern Nepal. The rhinos tend to spend a lot of their time in the water. And each one weighs between 2 and 3 tons. They’re massive, so it’s difficult to imagine the level of flooding necessary to sweep away one of these giant animals and carry it over sixty miles. In the early 1900s, this species was nearly extinct. Perhaps only 200 or so individuals survived. In 2007, an estimated 378 rhinos lived in Nepal, and another 2,200 lived in India. Thanks to a concerted effort by conservationists in both countries, populations have rebounded to about 3,550 individuals as of 2017. And it’s this admirable level of concern and cooperation that’s helping to rescue these rhinos during the monsoon season along the Indo-Nepal border. But the floodwaters are only part of the problem for the displaced rhinos. After being carried downstream by monsoon rains, the animals often end up wandering about in the agricultural areas that sit between the protected areas where they’re supposed to live. And local populations don’t know how to deal with them. In fact, farmers sometimes chase the rhinos out of sugarcane fields and throw stones at them. In addition, poachers are ready and eager to take these rhinos once they’re outside of protected areas. “Our prime concern is the safety of the straying animal, irrespective of their place of belonging,” Gaurav Ojha, Valmiki Tiger Reserve divisional forest officer, told Mongabay. Bravo, Nepal and India. If only more cooperative joint ventures could happen in the world. How many species might be saved from all sorts of disasters and crimes? We need to find productive ways to work together to help wildlife in peril. It’s time to do a better job of lending rhinos a hand and helping them survive.